MUX click is a Click board™ that switches one of the four differential inputs to one differential output. It employs the MUX509, a modern CMOS analog multiplexing integrated circuit, produced by Texas Instruments. This IC can be powered with both dual power supplies, ranging from ±5V to ±18V, and single power supplies, ranging from 10V to 36V. It offers rail-to-rail operation, allowing the input signal to swing up (and down) to the voltage of the power supply, with no distortion. Features such as the break-before-make switching action, electrostatic discharge protection up to 2kV, low on-resistance and low input current leakage, make this circuit a perfect solution for various switching applications, especially those that utilize differential signals. The MUX509 itself uses three control pins to perform signal switching. 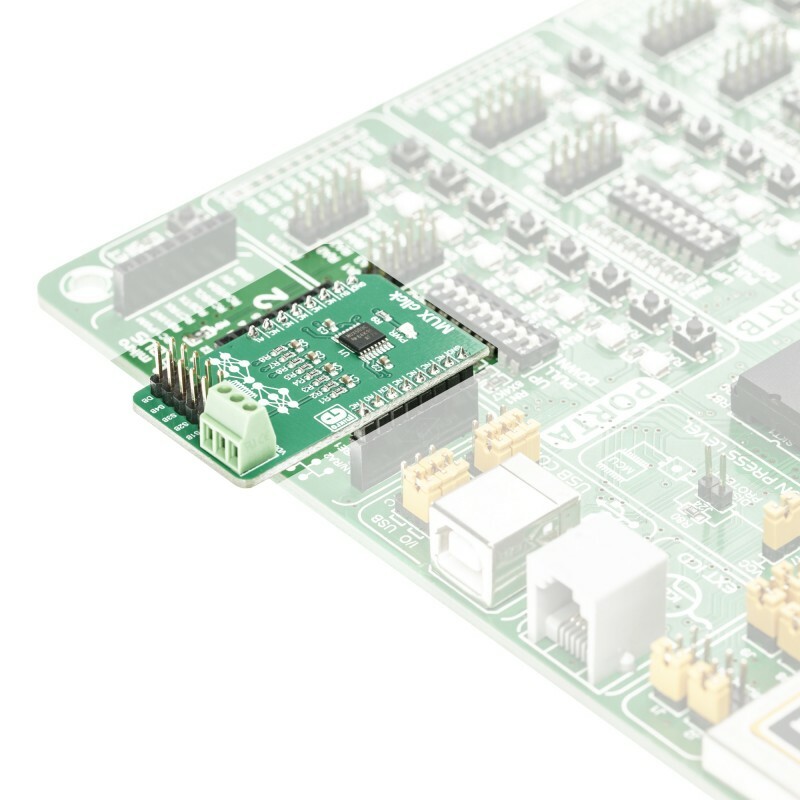 These pins are routed to the mikroBUS™, allowing simple interfacing with the host MCU. 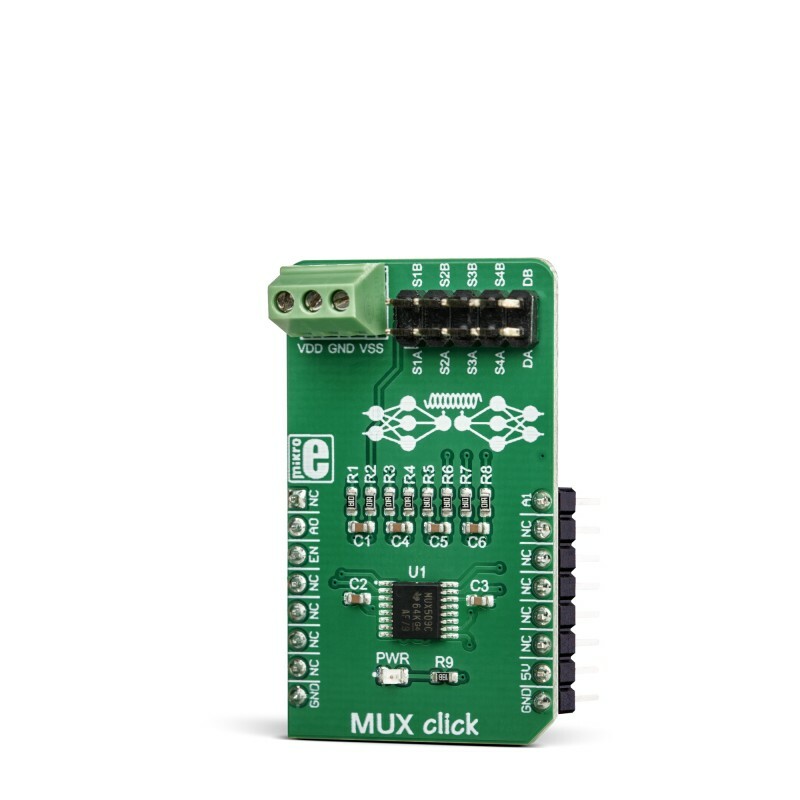 In addition, MUX click comes equipped with the three-pole terminal for the power supply, as well as with the standard 2.54mm 2x5 pin header for the input and output signals. This makes connecting all the wires simple and reliable, allowing the Click board™ to be operated right out of the box. 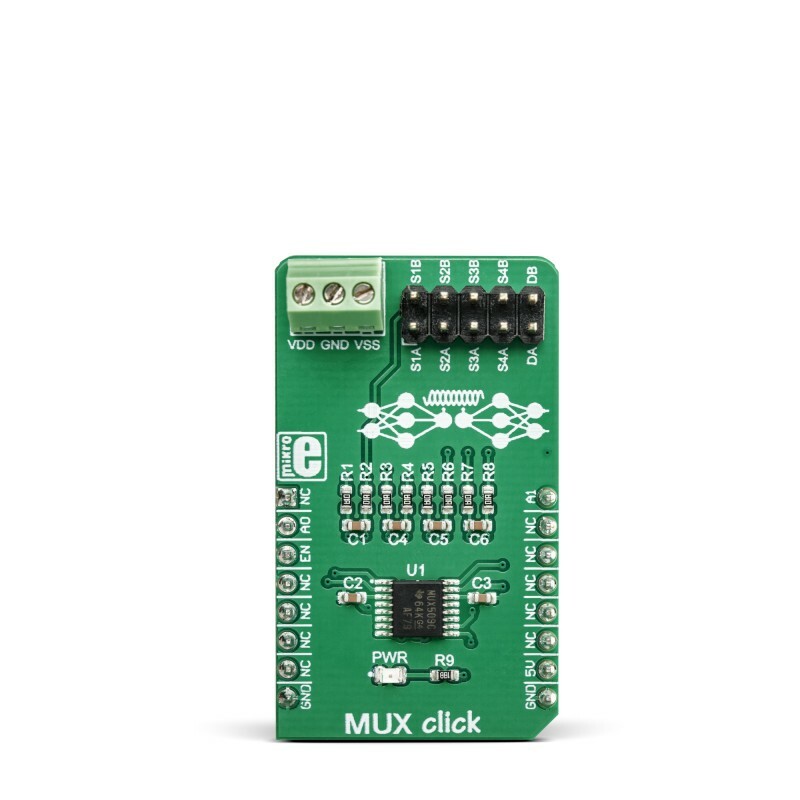 MUX click is equipped with the MUX509, a precise analog multiplexing IC, produced by Texas Instruments. The MUX509 can be used with a wide range of power supplies. It can handle both dual and single power supplies, as well as the symmetrical and non-symmetrical ones. This allows it to be used in a very wide range of different applications. Another property of the MUX509 IC is that it has dual inputs and dual output. Three control pins are used to switch one of four input pairs to a single output pair. 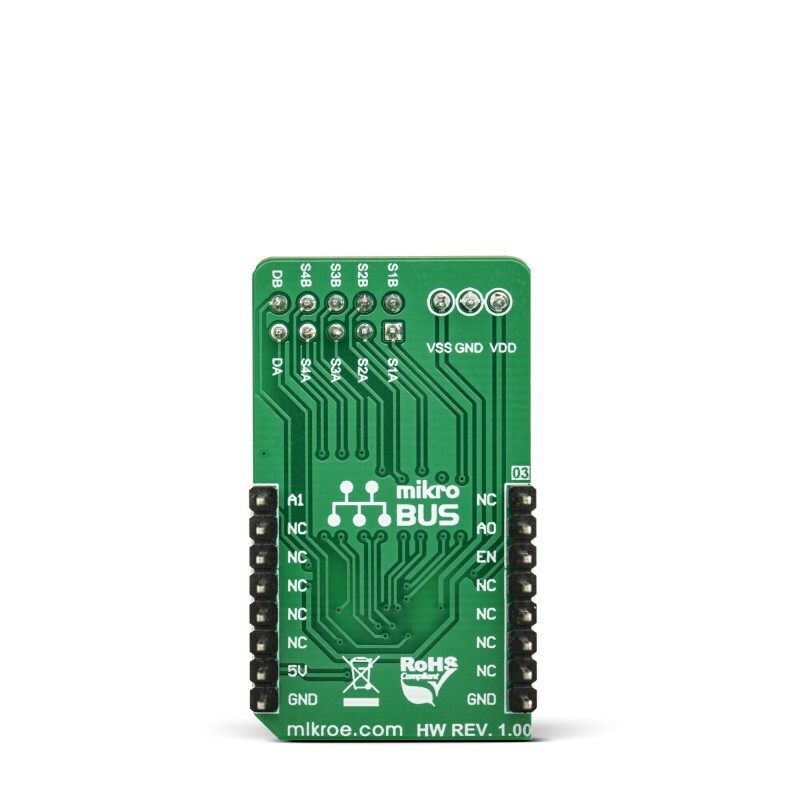 Control pins labeled as A0 and A1 are routed to the mikroBUS™ and can be operated by both 3.3V and 5V MCUs. The third control pin is labeled as EN pin, used to enable the output when is set to a HIGH logic level (it is active HIGH). A0 and A1 pins are routed to RST and PWM pins of the mikroBUS™ respectively, while the EN pin is routed to the CS pin on the mikroBUS™. The MUX509 IC is targeted towards working with differential signals, rather than working with the single-ended inputs. Each input is composed of two pins: SNA, and SNB, where N represents the channel number in the range from 1 to 4. When a specific channel is selected (N), both the SNA and SNB pins of that channel will be routed to the DA and DB output pins, respectively. For the improved stability, each signal pair is equipped with the 100nF parallel capacitor and 100Ω series resistance. The input and the output signal pins are routed to the standard 2.54mm pitch 2x5 pins header on the Click board™. The ultra-low leakage current ensures that there is no signal interference from the inputs that are not selected by the A0 and A1 pins. A low crosstalk also ensures that the signal on one channel remains clean of interferences caused by other channels. To prevent any two inputs to be switched at the output at the same time, a break-before-make switching action is utilized. This ensures a reliable operation of the IC and the Click board™ itself. 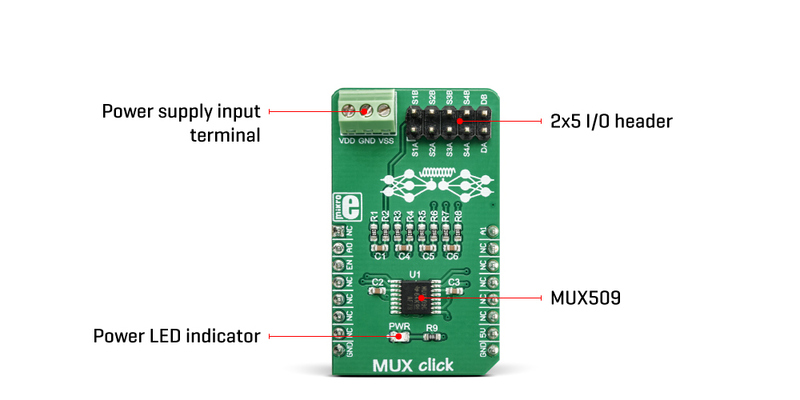 MUX click does not use the power from the mikroBUS™ power rails, except for the LED indicator. Instead, a three-pole screw terminal is used to connect an external power supply. Having in mind the minimum input voltage of 10V or ±5V, a power supply should be connected to this terminal before operating the Click board™. Depending on the type of the used power supply (single supply or symmetrical/dual supply), it should be connected to the power supply input terminal, accordingly: GND is the reference ground connection, VSS is the negative voltage connection terminal (GND if a single power supply is used), and VDD is the positive voltage connection terminal. The input and output signals can be connected via the 2x5 pins header. As mentioned before, the MUX509 IC supports rail-to-rail operation, supporting input and output signals that range from VSS (or GND) up to VDD. Independent power supply input allows the user to work with a wide range of signal amplitudes, depending on the application requirements, as long as the power supply stays within the limits. More information about the MUX509 can be found in the attached datasheet. However, the Click board™ comes equipped with a library that contains easy to use functions and a usage example that may be used as a reference for the development. This table shows how the pinout on MUX Click corresponds to the pinout on the mikroBUS™ socket (the latter shown in the two middle columns). The library includes function for set current active mux channel and function for enable or disble mux device. Application Task - (code snippet) - Sets the current active channel. Changes the channel every 5 sec.